The Texas Blackland Prairies are a temperate grassland ecoregion located in Texas that runs roughly 300 miles (480 km) from the Red River in North Texas to San Antonio in the south. The prairie was named after its rich, dark soil. The Texas Blackland Prairies ecoregion covers an area of 50,300 km2 (19,400 sq mi), consisting of a main belt of 43,000 km2 (17,000 sq mi) and two islands of tallgrass prairie grasslands southeast of the main Blackland Prairie belt; both the main belt and the islands extend northeast/southwest. The main belt consists of oaklands and savannas and runs from just south of the Red River on the Texas-Oklahoma border through the Dallas–Fort Worth metropolitan area and into southwestern Texas. The central forest-grasslands transition lies to the north and northwest, and the Edwards Plateau savanna and the Tamaulipan mezquital to the southwest. The larger of the two islands is the Fayette Prairie, encompassing 17,000 km2 (6,600 sq mi), and the smaller is the San Antonio Prairie with an area of 7,000 km2 (2,700 sq mi). The two islands are separated from the main belt by the oak woodlands of the East Central Texas forests, which surround the islands on all sides but the northeast, where the Fayette Prairie meets the East Texas Piney Woods. This area was shaped by frequent wildfires and plains bison. Large fires ignited by lightning frequently swept the area, clearing shrubs and stimulating forbs and grasses. Large herds of bison also grazed on the grasses, and they would trample and fertilize the soil, stimulating the growth of the tallgrass ecosystem. Hunter-gatherers contributed to the formation and expansion of the prairie through controlled burns to make more land suitable for hunting bison and other game. Hunter-gatherers continually inhabited the prairie since pre-Clovis times over 15,000 years ago. In historic times, they included the Wichita, Waco, Tonkawa, and Comanche, each of whom were gradually replaced by settled agrarian society. The advent of large-scale irrigated farming and ranching in the area ended the expansionary period in the prairie's formation and quickly led to widespread habitat loss. Because of the soil and climate, this ecoregion is ideally suited to crop agriculture. This has led to most of the Blackland Prairie ecosystem being converted to crop production, leaving less than one percent remaining (and some groups estimate less than 0.5% to less than 0.1% remaining) and making the tallgrass the most-endangered large ecosystem in North America. Small remnants are conserved at sites such as The Nature Conservancy's 800-acre Clymer Meadow Preserve near Celeste, TX. Important prairie plants included little bluestem, yellow indiangrass, big bluestem, tall dropseed, and a variety of wildflowers including gayfeathers, asters, Maximilian sunflower, wild indigos and compass plant. The fauna of the Blackland Prairies includes foxes, frogs, lizards, rattlesnakes, opossoms, coyotes, white-tailed deer, and striped skunks. The prairie was formerly home to animals such as American bison, wolves, and jaguars before overhunting and the destruction of most tallgrass ecosystems. The soil of the Blackland Prairies, from which the "blackland" get its name, contains black or deep dark-gray, alkaline clay which is further blackened by char from wildfires and controlled burns. "Black gumbo" and "black velvet" are local names for this soil. In dry weather, deep cracks form in the clay, which can cause serious damage to buildings and infrastructure. Soil management problems also include water erosion, cotton root rot, soil tilth, and brush control. 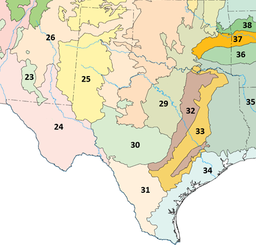 ^ a b c "Ecoregions of Texas" (PDF). U.S. EPA. Retrieved 2016-02-06. ^ "Blackland Prairies". Invasives 101. Texas Invasives. Retrieved 2017-02-06. ^ "Post Oak Savannah and Blackland Prairie Wildlife Management: Historical Perspective". Texas Parks and Wildlife Department. Retrieved 2008-08-15. ^ "Soils of Texas". Texas Almanac. Texas Historical Society. Retrieved 2017-02-26. "Texas blackland prairie". Terrestrial Ecoregions. World Wildlife Fund.